Our change in debit/ATM card providers has opened your access to 32,000 surcharge free ATM’s nationwide. In having this access to ATM’s of other banks, we want to inform you of an issue that is becoming more common across our great nation. The issue is the use of a skimmer on the ATM to extract your card information. A skimmer reads the information from your card on the device or it is transferred to an offsite storage media. 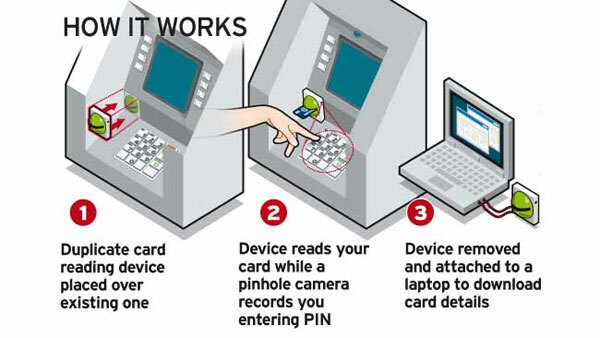 A skimmer can be attached magnetically to the card reader or to the entire face of the ATM. These devices are typically placed on ATM’s to capture weekend usage and removed after a short period of time. However, the skimmer can be attached for an extended time as well, if the device is not discovered. A skimmer is difficult to detect. You may look for loose, crooked or damaged parts on the face of the card reader or the area around the screen. At the present, Android phones have the ability to download an app that can detect a skimmer. This is not to discourage from using an ATM, we simply want to make you aware of the issue.